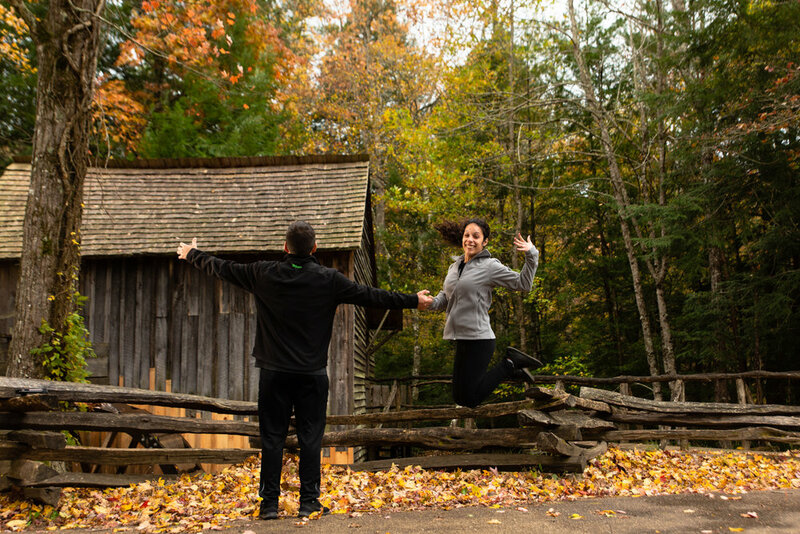 Not quite - how about a couple from Florida lucky enough to time a marriage proposal during the peak of the fall foliage in the Smokies? Javier contacted me several weeks before about proposing to his lady love during the first weekend of November. Usually, you can count on the foliage to be at its best around the third week of October. I can tell you - it happens exponentially. Sure, you start seeing splashes of color here and there, but a couple of chilly nights, and you wake up one morning and BOOM! Orange! Yellow! Scarlet! But when will that be? I have to shrug. There are several factors that go into producing these colors, such as how hot the summer was, hot wet September was, has a cool-down occurred, etc. 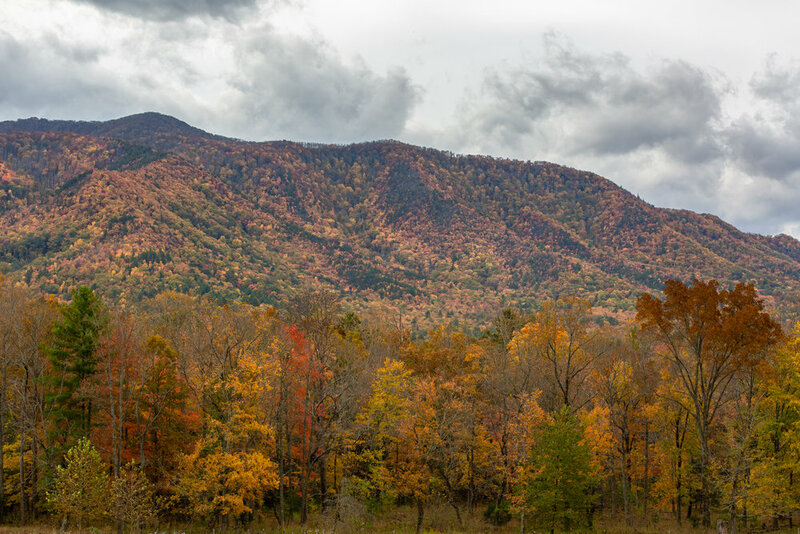 I can promise you this, though - starting in October, the weekends in the Smokies get busy with what we locals call “leaf-peepers,” the tourists who come to see our fall colors (and bears) and hope to experience some crisp nights with the smell of wood smoke in the air. The problem when it comes to proposals, though, is privacy. As in, where can someone propose and try to escape the crowds that come to popular places like Cades Cove? And did I mention rain was threatening? So I found myself watching weather and advising Javier, we had better do it on Thursday, November 1st, to avoid both the crowds and the rain storms headed to East Tennessee. I love this planning and execution. It feels like this grand spy adventure with furtive texts, exchanging pictures to recognize each other, and whatnot. Javier was clever - he asked Amarylis to drive so he could keep in contact with me, changing drivers when they got to Cades Cove to be sure to find the spot. Although he had not been to it before, I had previously scouted it and sent him pictures, so he’d know he was in the right place. Here was the plan: he would have her do a jump shot to let me know Operation Marry Me was imminent. And while they were walking about the spot, I was playing the part of a disgruntled nature photographer, rolling my eyes because some couple were in my picture. It worked, too - Amarylis later told me she spotted me and thought, We gotta go, we’re ruining that poor lady’s shot. One small glitch - proposals mean happy tears and happy tears mean slipped contact lenses. A quick fix and we were ready to do a photo shoot to remember this day by. Javier did a nice job picking this sparkler, no? It seems this shot is a tradition with this couple. Join me in wishing this beautiful couple all the health and happiness their life together can hold! And, as they were excited Floridians, I hope my wishes for (1) a bear sighting and (2) some snow flurries came true for them in this trip to the Smokies!